The pride of Punjab is back and ready to roar. Insider.in is the official ticketing partner of Kings XI Punjab this season. Tickets are live now for their home games in Mohali! Based in Mohali, Kings XI Punjab is one of the teams in the Indian Premier League that have played since its inaugural edition. Over the years, the squad has featured the likes of Yuvraj Singh, Virender Sehwag, and Glenn Maxwell. In their most successful season in 2014, they went all the way to the finals but lost to Kolkata Knight Riders (even with a score of 199/4). This year, with a revamped support staff and heavyweights like Chris Gayle, Mohammed Shami and Andrew Tye, the team has a fighting chance for history to repeat itself - but this time with a tournament win. Watch Kings XI Punjab play against Kolkata Knight Riders, Chennai Super Kings in Mohali! When: March 25, 8 p.m. When: March 30, 8 p.m. When: April 1, 8 p.m. Result: Kings XI Punjab beat Delhi Capitals by 14 runs! When: April 6, 4 p.m. When: April 13, 8 p.m. Result: KXIP won by 12 runs. KXIP - 186/2 (20 overs) and RR - 170/7 (20 overs). When: April 29, 8 p.m. When: May 5, 4 p.m.
Tickets are also available at the below locations. In a surprising turn of events, KXIP had the busiest auction by bringing in 13 new faces to the family - a highest among the eight teams. The highlight of the night was when the team purchased the T20 star mystery spinner Varun Chakravarthy after a bidding war that also involved Delhi Capitals, Chennai Super Kings and Rajasthan Royals. The mammoth amount of money was the most any team has spent on an uncapped Indian player in this auction. Having a shortage of pace bowlers, they roped in India international Mohammad Shami and English all-rounder Sam Curran. The team also found their 'Simran' this year, the 17-year-old whiz kid, Prabhsimran Singh, a wicketkeeper-batsman from Patiala. Speaking of wicketkeepers who can bat, KXIP also found themselves a ‘keeper’ in Nicolas Pooran. After releasing 11 players ahead of the Season 12, KXIP have completed their squad with 23 players. A season that promised so much ultimately that it couldn’t live up to the expectations created at the start. A new captain, new squad, new backroom staff meant some new ideas and strategies which, in principle, were refreshing and noteworthy. Lokesh Rahul had a phenomenal season with 659 runs, a KXIP record and so did Andrew Tye whose 24 wickets might win him the Purple Cap despite KXIP not reaching the playoffs! In Chris Gayle and Karun Nair, they ensured their top order was one of the best in the tournament, while young Mujeeb ur Rahman and Ankit Rajpoot provided plenty of signs to prove that the future is in good hands. 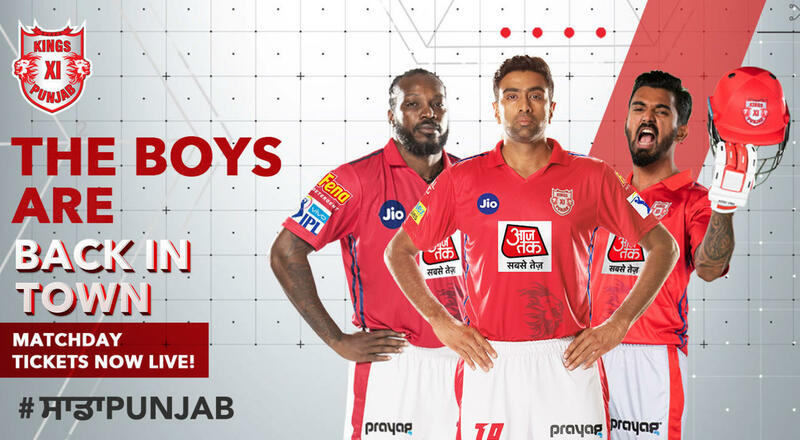 R Ashwin’s captaincy was interesting and fresh as well and he too will have learnt from this experience as Kings XI Punjab look to come back in 2019 stronger and smarter. The full group stage VIVO IPL 2019 Schedule! Click on the hyperlinked matches in blue to get tickets! Fan of Kings XI Punjab? Here's some more content from Insider.In that you might like! Insider.in: Official ticketing partner for the VIVO IPL 2019 for Delhi Capitals & Kings XI Punjab.